By taking time in the fall to remove your old plants and mulch you will not only set yourself up with a healthy garden come spring but you will give your soil a much needed chance to rest debris free. This is especially important if you had any pests or diseases this growing season. By cleaning things out and removing all infected plants you will help your soil heal. If you do not do a good job cleaning out or skip this step altogether you will not only have the same problems next growing season but find yourself in a disastrous growing situation. These wonderful visitors decided to invade my garden along with another 10,000 aunts, uncles and cousins. If you don’t want the same visitors next season, pull it, toss it, burn it. Then, another visitor decided to sneak in without my knowing and systematically destroy every pumpkin and squash in my garden. These are horrible little creatures and they can kill your garden quick. They sneak in and by the time you realize there is a problem, the damage has been done. To stop next seasons invasion, be thorough when you clean out in the fall. Get ever root no matter how small and put all plants and roots very far away from your garden. As with all big jobs, if you break things down into small steps it is much easier to tackle. Steps will also make sure you do not forget anything and you can check this chore off your to-do list for the year. 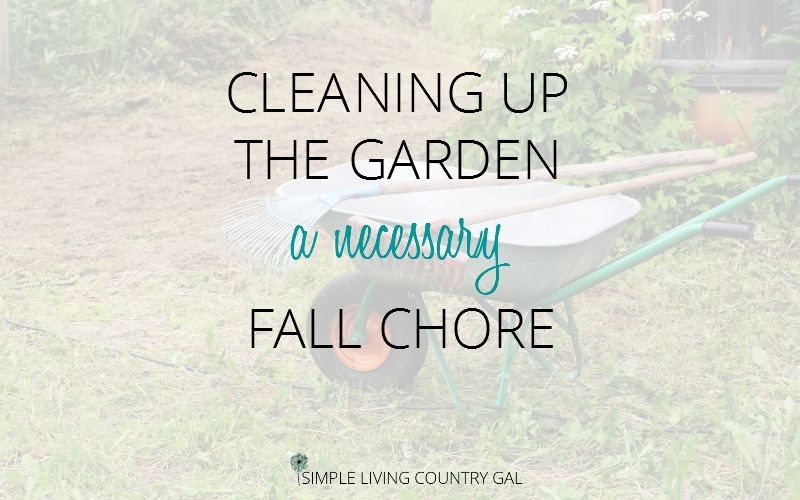 Cleaning Out Your Garden For Fall. Step #1 Clean it out. When cleaning up your garden, make sure you clean it all out. Remove any produce, plants, roots, mulch and weeds. It is important to be thorough to make sure you keep recurring diseases and pests to a minimum. 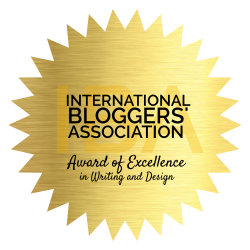 I am learning to be more vigilant at this point. Especially after my summer long battle with pests this year. Remove it now so you don’t pay the price later. Step #2 Leave some. If you mulch with newspaper you can certainly leave the pieces in there. They will compost down over the winter and will all but be gone come spring. If, like I mentioned above you had any instances of disease or pests I would not leave any mulch at all. Step #3 Call in reinforcements. I like to have my chickens take over for as long as possible. This is one of the reasons why I chose to house them so close to my garden. They will get in there and scratch up the ground eating bugs and pests (most but not all I’m afraid). This really does help keep things under control. 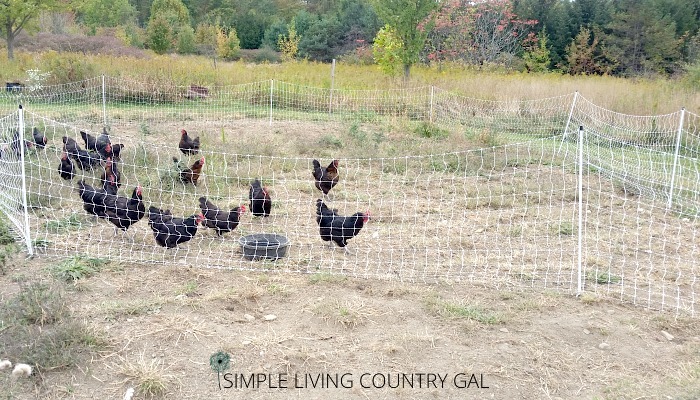 I purchased this poultry netting this year and it has been a lifesaver! Since the holes are pretty small it keeps the chickens in with no incident of escape. I don’t even have to electrify it. 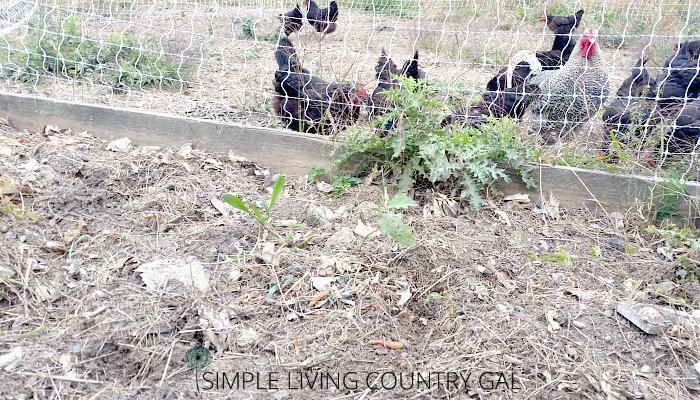 I simply make a shoot from the chicken run and put my gals exactly where I need them, moving it as they complete an area. It is working so well I am actually kicking myself for not making the investment and and doing it sooner. Step #5 Dispose of your plants. If you have any incident of disease or pest invasion. (no, I may never get over this) It is important to not put any debris from your garden anywhere near your compost bin. That way you will not risk any of those plants or dirt being put back into your garden come spring. Find an area where you can safely put your garden plants until you are able to burn them later. Note: Follow your area’s rules for burning and of course please follow all safety and use caution. We have a dump area in the back of our property where we put our diseased plants, produce and mulch. That way we know for sure the diseased plants are well away from our garden. NINJA TIP: If you live in an area that has brush collection, leave your diseased garden debris out for pickup. Your goal is to get all plants away from your garden so the chance of re-infestation is decreased. Step #6 Remove all stakes and cages. Don’t forget to remove your supports, clean them and store in a safe dry area. If you had a disease in your tomatoes and use cages as supports, you may also want to do a light bleach spray, rinse and let dry in the sun before storage. Step #7 Leave your winter plants. Clear all plants out of your garden, except for things you may be over wintering such as spinach, scallions or garlic. If you live in a cold winter climate, you will want to put a nice layer of straw or other mulch to keep plants better protected. Step #8 Keep plants for the good guys. 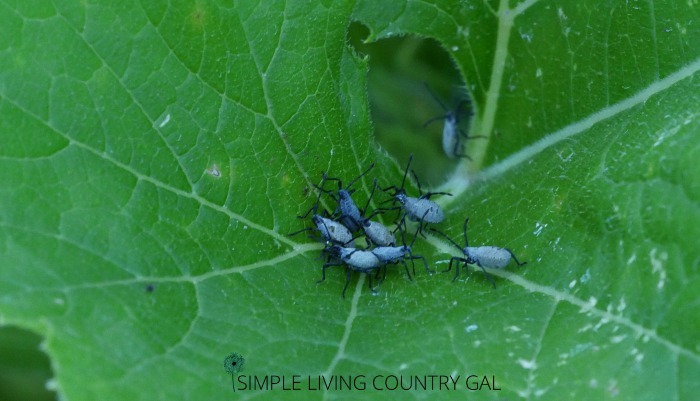 If you use beneficial insects in your garden, they also will overwinter in plants. I would suggest leaving 1 or 2 non diseased perennial plants so your good guys have a place for the winter months. Step #9 Turn your soil. Take a shovel and do a quick turn over of your soil. This will help your soil to breath and also bring any roots to the surface that you may have missed. Step #10 Feed your soil. Now is the time to add a layer of mulch to your freshly cleaned soil. A nice thick layer of healthy mulch will go a long way to boosting your gardens nutrition. Cleaning up your garden for the winter may seem like just a tedious chore, but it is so much more than that. Take the time to remove the old plants, turn your soil and add healthy mulch and you will have a much healthier start come spring. I know there is a lot to do each month on the homestead and so often some of our chores can easily be forgotten. Sign up for my newsletter A Natural Homestead and you will get your very own Homestead Project Planner pack. This is the planner Hubs and I use every year and it is the reason we get so much done without going into debt to do it. Oh, and it’s totally FREE kids!! « How To Make A Budget. A Crash Course For Beginners. 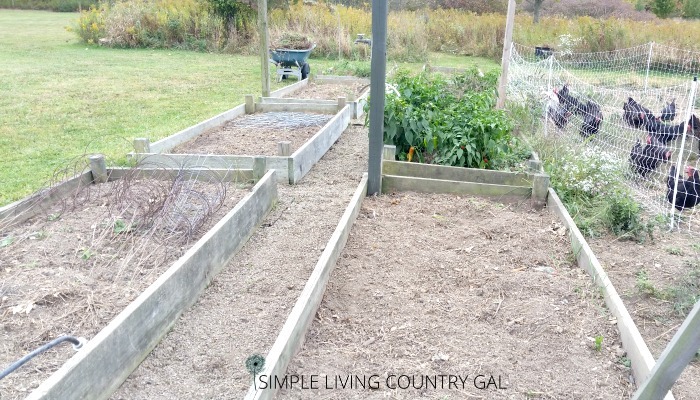 I think I’ve always known it was wise to tend the garden in the fall and prep it for winter and next year, but reading through your post really makes it clear WHY it is so important! Thanks so much for sharing all these tips. Oh this rings so close to home! 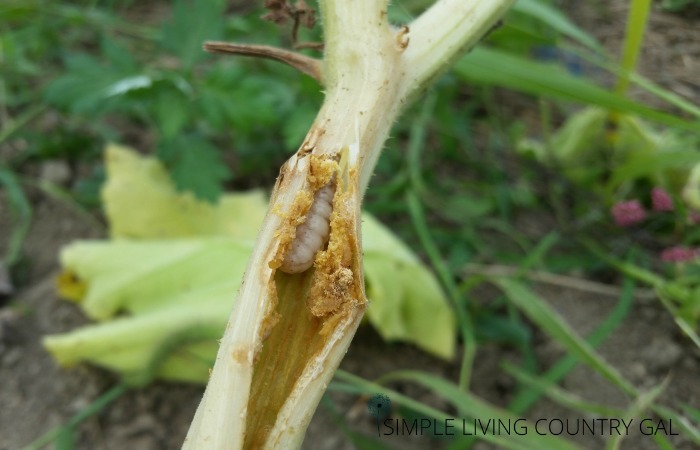 We had a terrible time with horn worms and squash bugs! 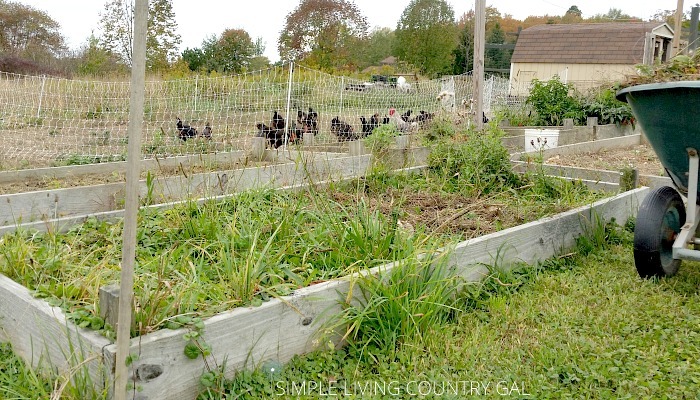 I’m hoping turning my chickens in the gardening spot will help with those little pesky things! The horn worms especially those suckers can eat a whole plant in a night! Thanks for the great read! I had a horrible problem with horn worms a few years ago. I have since planted marigolds around my tomatoes and I have not had a problem since. You should try it out and see if it helps you!